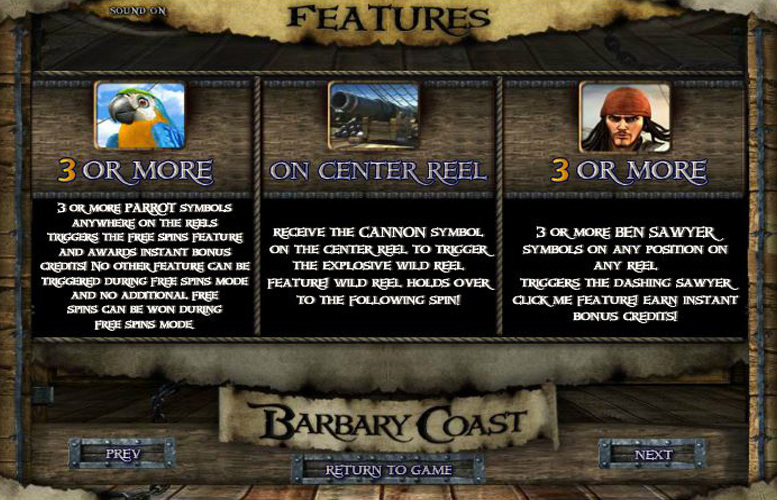 Barbary Coast is shamelessly based on Pirates of the Caribbean. There’s no two ways about it. Swashbuckling Benjamin Sowyer bears a striking resemblance to Captain Jack Sparrow and even the logo is almost a carbon-copy. Disney aren’t in the habit of licensing their products to gambling game manufacturers and that might account for the liberties that have been clearly taken here. That said, the game isn’t a bad one. There are a lot of great features, and the theme of pirates (Caribbean or otherwise) will always prompt excitement. There are one or caveats however. As usual with BetSoft products, the betting limits are low, as are the main game prizes. In a break from form, the artwork and animation isn’t up to much either. We’re used to better from this developer, frankly. Great array of bonus features. Barbary Coast is almost as exciting as riding the seven seas for yourself. Artwork and animation could be better. Titles like A Christmas Carol from BetSoft have truly spoiled us. The bar has been set high and if the illustrations aren’t as detailed and original as the Ghost of Christmas Future, we’re just not interested. Like many Betsoft offerings Barbary Coast won’t appeal to those who like to drop massive jackpots once in a blue moon, or higher rollers. Maiden = 300x the line bet. Skull and crossbones = 250x the line bet. Treasure chest = 250x the line bet. Coins = 225x the line bet. Landing three or more parrot symbols anywhere on the reels will trigger the free spin mode as well as an instant cash prize. Players should note however that the game’s other features cannot be triggered during the free spins and more parrots during the mode don’t trigger additional free spins. Landing the cannon on the centre reel in any position will trigger the explosive wild reel feature. The entire central reel remains “wild” for the following spin. Landing three or more Captain Jack Spar… Oops, Ben Sawyer symbols on any position on any reel will trigger the “Dashing Sawyer “Click Me” Feature. Here, players must pick pirates to unlock instant cash prizes. The game’s most exciting mode is surely the Fight Bonus. It’s triggered by landing three or more Captain Blackbeard symbols on any active pay line. Players must take on the might BlackBear in a sword fight. By rescuing the beautiful maiden, they’ll earn instant credits. Y’arr, me ‘earties! Landing three or more of the deck hands symbols on any active pay line will trigger the “Grog Challenge” Bonus Round. Players must compete for cash in a drinking contest against the worker. Be warned, however, he looks like he can handle a few. Pistol = 175x the line bet. Compass = 150x the line bet. Map = 125x the line bet. Cannon = 100x the line bet. Barrel = 50x the line bet. 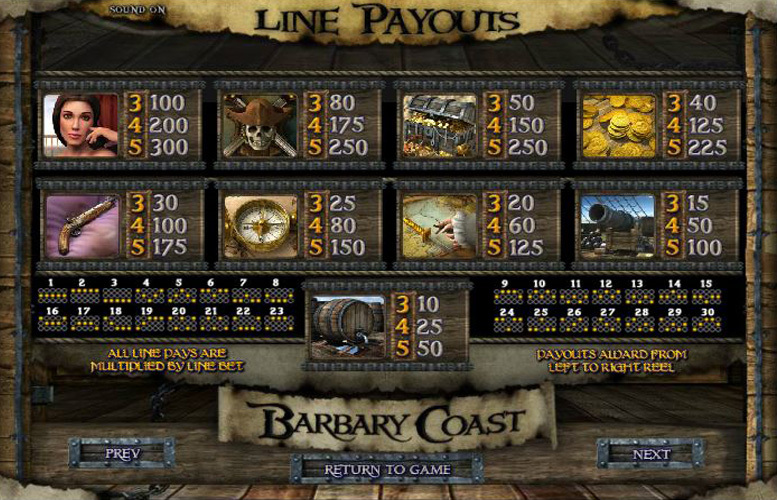 Players are given maximum control over how to distribute funds across the reels on Barbary Coast. They can adjust the number of active win lines between one and 30, the amount bet per line between one and five coins, and the cost of the coins played. The lowest coin value is 2p and the highest, £1. With all values set to the minimum the lowest possible bet per spin is just 2p. Meanwhile, maxing all variables out will cost the player £150 per turn. 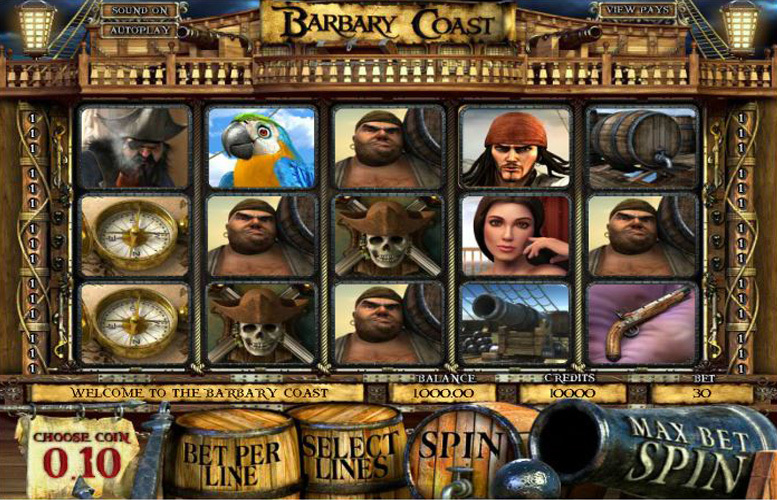 Unfortunately, as with many BetSoft games, Barbary Coast does not cater well to the highest rollers around. All told, Barbary Coast is a solid enough game to play. It could be absolutely fantastic with a few tweaks and BetSoft’s best artists working on it. Maybe the aim was simply to rip off Pirates of the Caribbean as much as possible without getting sued. Criticisms aside, the title does offer excitement for gamers. If you’re not really bothered how a game looks and feels and are all about the gameplay, you might really enjoy Barbary Coast. This game has a rating of 4 / 5 with 492 total reviews by the users.